Don't forget the Fertilizer and Pesticide, they are important for your trees. Trees, just like you and I need proper nutrients and the soil does not always provide enough. Even if a tree has thrived for years without fertilizer that does not mean that it will continue to do so. ​Over time a tree can deplete the ground it is growing in of many of the essential nutrients that it needs. Because of this it is important to have your trees fertilized regularly. Think how sad it would be to have a tree that you love slowly die because of a lack of nutrients when such a fate could have been avoided. 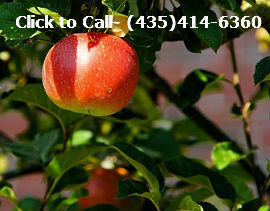 St. George Tree Service has the ability to fertilize even your biggest trees. Pesticide treatments are also important. The St. George Area has a lot of pest, partially because of our wonderful climate. Insects can actually kill a tree and the last thing we would want is for your tree to die because of bugs. St. George Tree Service offers pesticide treatments so that your trees can remain healthy for years to come. Occasionally trees do not have the inner core strength that they need to withstand the elements. When this happens a tree can split and or fall over in a storm which kills the tree. No one wants this to happen, especially if the tree falls on something important, like your house. ​To prevent this from happening a tree can be bound and staked with cords. If you have a tree that you are concerned about then don't hesitate to give us a call at (435) 414-6360 and we would love to come and take a look.